A LETTER TO THE WOMAN AT THE PARK. 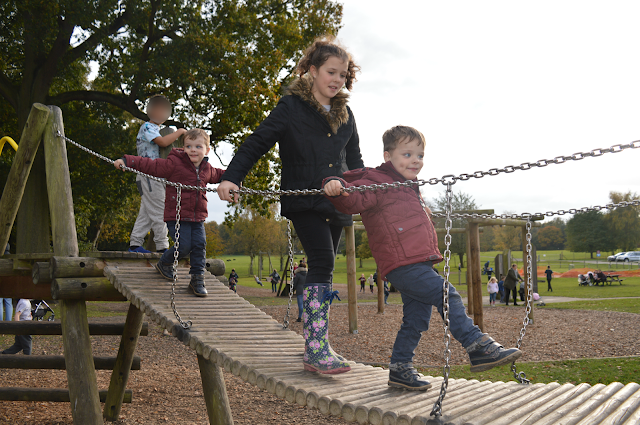 Today, I took my 3 children to Tatton Park in Knutsford and you were there. I saw you at the adventure playground and you saw me. Infact you couldn't miss us, could you, really? I saw you, standing on the sidelines, nudging your mother, as you commented on every aspect of my parenting skills. You see it is half term and I like to take my children out, as most of us do. Indeed, your children were enjoying a day out with you. The difference between me and you though is that I have two three year olds and you don't. Now I'm not trying to make myself sound special in any way - believe me, I would love to stand there gossiping about other mothers, but you see, if I so much as blink at the wrong moment, one of my twins could be gone and how do you chase him, when you have the other one too? That is probably why we looked like the 'crazy' family to you. Me, trying to parent two three year olds on an adventure playground in half term. When my son was pushing in front of yours, you probably heard me saying nicely that 'we don't push in' while trying to control my other son with my other arm - he was trying to run off. Yes, I allowed him to stand in front of yours - I knew your child was next - it was easier than having a full blown confrontation and risk losing my other boy as a result. I saw you watching us as we took turns on the zip wire. My 3 year olds have never experienced this before, so yes they did keep falling off and yes I did need to use that extra pair of eyes in the back of my head, to make sure his brother wasn't trying to do a runner when I was assisting the other. What you will never understand if you haven't got twins, or two children very close in age, is that you have to do these things or your children will never learn. Never learn that we need to queue, never learn that you stay near Mummy, never learn that if you stay near your brother, Mummy doesn't need to get stressed out. Yes I could have taken the easy way out again, today. Took the pram. Sat them in side by side. Let them watch the other kids play. My children are three and a half and we are trying so hard to get it right. We know we'll get there with the support of our family and friends and members of the public who are supportive. Some people can be really lovely. They get that 'it must be hard' and they don't judge. They'll offer to hold one while you go and grab the other one. They help where they can. Looking after twins isn't just twice as hard as looking after one, it's ten times as hard. The only way I can put this into perspective for you is this. Would you take your three year old to the park and let him go off? I mean really go off. You now can't see him. Are you worried yet? It's like this every time we go anywhere without a pram. Yes, I do sometimes look like some wild woman, I do sometimes yell my child's name at the top of my voice. I do speak sternly to them when they are both not listening, but it is because I am scared witless of losing one. And it's like this each and every day. Not just for the two minutes that you saw us for, today. So next time you think about casting your judgements in my direction, or presuming that you know how you would handle it better. Stop. Have a word with yourself and move on. We left soon after. You spoiled it. We went back to the car to get the pram. I was snappy and upset that we had embarrassed ourselves in some way and that we shouldn't be there. We weren't normal, like the rest of you. And do you know what, when I got back to my car, there was a lady at the car next to me. She had a baby in a baby carrier and a toddler. She smiled my way and said, 'That'll be me soon.' She understood what lay ahead for her. It's just a shame that your pedestal is situated so high, that you fail to see that not all families are the same. We all have something we are battling to fix with our children. From that little conversation with that lady, I decided that we would continue our day as planned. We went to the farm. We enjoyed it. In fact we enjoyed it so much, I'm going to write another blog post about it tomorrow. P.S The boy in the image at the start of this letter, with his face blurred out, isn't your child, but I suppose you already know that too! I'm sorry you were made to feel like this whist out on a lovely day with your beautiful family. Some people just don't think about how their actions affect others. I'm glad another mummy turned it around for you though. You're doing a great job! x p.s. I love Tatton Park! Thank you. We did have a great day in the end. I would definitely go again. It sounds like your doing an amazing job to me :) Parenting twins must be so hard - keeping a constant eye on one toddler is hard enough! . Sorry the first part of your day didn't go well because of some judgey people but at least the rest of the day was really fun.